Entertainment Rights from the 1990’s released a range of friction powered Postman Pat vehicles. In November 2001 ER plc acquired Woodland Animations for £5.1 million; Woodland Animations Ltd became a division of Entertainment Rights PLC. The ER vehicles were far larger than their ERTL and Corgi die-cast predecessors. They were made in tough plastic and featured moveable parts and opening doors. As well as Pat 1, ER released friction drive Ted Glen’s Truck, Amy the Vet and Jeep, Friction Motorbike and Ajay Bains (‘ENP 724’ front wheel steers), Ajay Bains and Greendale Rocket, Dr Gilbertson and Sports Car (‘Sylvia 1’ bonnet and doors open), and, PC Selby’s Police Car. They also released friction vehicle sets such as the one pictured above. 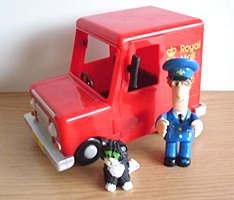 ER also released other Postman Pat merchandise such as their ceramic Postman Pat van egg cup holder. In 2008 ER plc ran into trading difficulties, going into administration the following year. The Postman Pat Master Toy Licence passed to the Character Group plc who produced a new range of toys from 2009 under the Character Options brand.